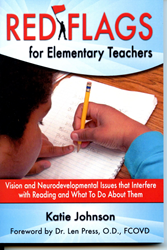 At the Florida Book Festival in Orlando, Florida on January 31, 2015, Katie Johnson won an award for Red Flags for Elementary Teachers, her second book about how vision and neurodevelopment issues can affect how children learn to read. Johnson's book placed in the General Non-Fiction category. I am so impressed by all of the writers here. Congratulations! Ten writers, from all over the United States, gathered to receive awards at the Florida Book Festival. The event was held at the elegant Grand Bohemian Hotel in downtown Orlando, Florida. There were winners in the categories of poetry, history, general fiction, general non-fiction, wild card, and gay. The grand-prize winner was also recognized. Each writer spoke eloquently and sometimes also amusingly about his or her work. F. Diane Pickett spoke movingly about her book, "Never Isn't Long Enough," a history of a southern family. Janet K. Humphreys's provocative work on the prison system, "The United States of Theocracy," gave rise to some interesting political conversation later in the evening, as did James Aiello's novel "Forbidden Child," about a fictional child of JFK and Marilyn Monroe. The Grand Prize Winner, Steve Burt, won for the latest in his series, "FreeK Week." The third in this set of novels about psychic teenage detectives, "FreeK Week" is coincidentally set in Orlando. Other winners and speakers were Ian Prattis, for "Redemption," "Jackie," by Samuel Newsome, "Truth Be Told: Adam Becomes Audrey," by Alexandra Bogdanovic, and "Love & Bliss," by Yogi Amrit Desai. JM Northern Media, LLC, produces several contests each year for writers and their work. This was the first Awards evening held in the Orlando area.